Update on July 02, 2012. Both Ainol NOVO 7 Aurora II and ELF II are in stock . All Aurora II orders are shipped out. We are working very hard to ship out the accumulated ELF II order in the last couple days. Update on May 15, 2012. The new English version Aurora is in stock ! Order now. If you have pre-ordered Aurora from us, check out here for status . Update on May 8, 2012. The release date of Ainol’s new model of NOVO 7 Aurora, aka Aurora II, is pushed out to end of June or beginning of July. In order to meet the customer demand on Aurora , the Aurora production has resumed, and English version will be ready to ship in the week of May 14. We are taking pre-order now. For customers who pre-ordered Aurora or Aurora II from us but not shipped, we offer three options: 1). keep the order. We will ship the English version of Aurora (black color) next week. 2). keep the order, get free upgrade to the new Aurora II when they are released in beginning of July. 3). Cancel the order and get full refund. We will email all of customers placed pre-order today and tomorrow, so make sure you check your emails and let us know your choice. For details check this news. Update on May 3: Lot of people are asking the status of their pre-order – they are not released yet. This week is China’s Golden Week – one week long national holiday. We will let you know the status once factories back to work next week. We talked to Chevy Wu, Ainol’s GM of International Business, today. According to him, Ainol has finally stopped the production of NOVO 7 ELF and NOVO 7 Aurora . “They will be replaced with upgraded models in mid of April”, Wu said, “Our engineering team is working on the new control board, and we are working with a new screen supplier”. Ainol’s ELF was found having dead pixel and a strip line problem. “The upgraded model will have a better quality high definition screen”. According to Wu, The prices for those upgraded model are not finalized yet, but they should be similar to the current ELF and Aurora. As Ainol’s oversea distributor , uPlay Tablet , is taking pre-orders on the upgraded version of ELF and Aurora. For customer who purchased Aurora from us but not shipped, we offer two options: 1). keep the order, get free upgrade to the new Aurora when it is released. 2). Cancel the order and get full refund. If you want to cancel your order, you can use the form in “Contact Us” to inform us your decision. For customer who want to pre-order the new ELF and Aurora, you can do it at the current ELF and Aurora product page. We may have to adjust a price a little bit, but at least this will put your order into the queue, so you get your priority. In addition, you can cancel your order any time before we ship it. We have shipped out all ELF order we have received. We only have 3 ELF left. Place an order now before they are all gone – then you have to wait a month to get ELF. Talked to Ainol’s International Business GM, Chevy Wu, very disappointed. There is no progress on both Aurora and ELF – they still haven’t solved the short of supply issue. For customers who want their tablet right away, we recommend the latest tablet just released by woPad, called woPad A10 , it’s basically the same as ELF except the screen. We have shipped out on Monday, March 11 all 30 Aurora that we picked up from Ainol’s warehouse last week. You should have received a shipping confirmation email from PayPal with the tracking number. If you don’t receive such email, your order is still on the waiting list for our next load. We suppose to get the next load this week, but when we checked with Ainol yesterday, there seems to be some delay. If you decide to cancel your order, you can contact us by using the contact form, we will cancel your order and refund you right away. We still have ELF White back case 8GB in stock . 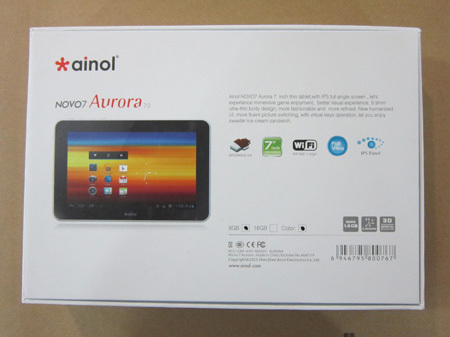 Since Ainol has released a major Android 4 .0.3 ICS firmware upgrade on March 8 (it has added full Google Market ( Google Play ) and FLASH v11.1 support), we are upgrading the firmware and setting the language and input into English for our customers before shipping . It takes a day or two to do so, so it may take 2~3 days before you receive the shipping confirmation email from PayPal after your purchase. Want to learn more about our shipping, read our shipping policy before contacting us.